PROCENTEC has released their new version of the Profitrace and in true PROCENTEC style have added some new and useful features. Some of you may not know but in version 2.6.2, PROCENTEC released the ability to search through the GSD catalogue (list of loaded GSD files) by; Ident Number, Model Name, Vendor Name, Found in Live List or by the Last Network Scan. This is very useful when setting up a device. 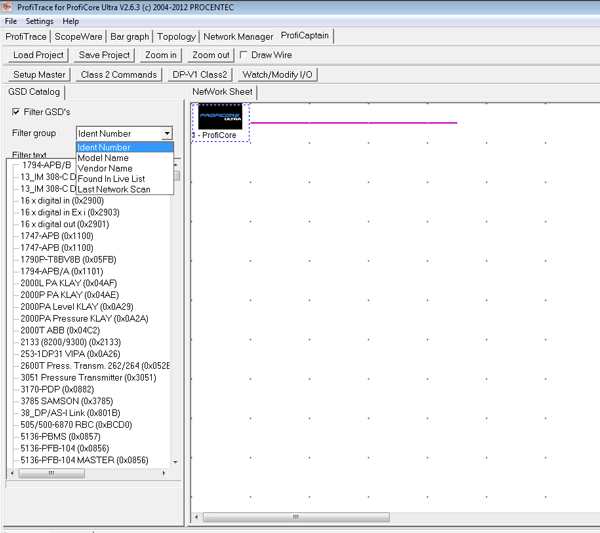 The latest offering that PROCENTEC has brought to the table is the ability to see the all the device's oscilloscope images displayed on the Live List. The advantage of this is that you can see all the waveforms in one view. The normal Profitrace oscilloscope functionality filters the oscilloscope images based on the responses of a single slave, when that slave has been selected you will only see the waveforms from that device. When networks are very large, you would need to view every device's waveform on the network to determine if there are problems, at times this can be tedious. To some this new feature may seem minor and unimportant but to be able to have a holistic view of the network means that there is less chance that something has been over looked. This can help you to diagnose the problem faster and result in shorter down times.